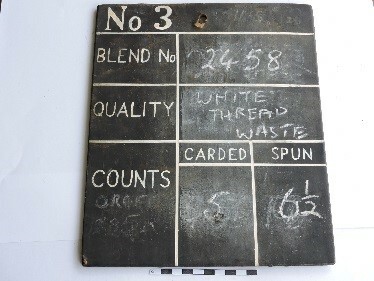 Tally Board from Holywell Textile mill with chalked instructions for workers. 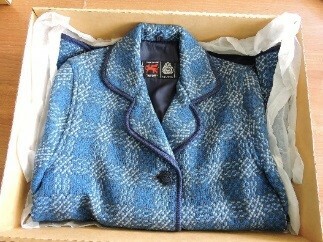 Ladies wool jacket made and sold at Holywell Textile Mill, 1970s. The Holywell Textile Mill was located next to St Winefride’s Well and like many factories it used the spring water in the manufacturing process. The factory produced many high quality woollen products including tweed jackets, tapestries and blankets made from Jacob wool. In the First and Second World Wars the factory produced uniforms for French and British soldiers. The factory closed in the 1980s and was partly demolished although the shop building still remains. The museum has a number of objects related to the mill that were saved from the factory floor, including carding combs, shuttles and batch number boards, as well as examples of their products. There is also a small photographic archive. Many local people were employed here and their memories have been recorded at the museum as an audio record. Visit the museum to hear their stories.